Superior can transform unused overhead space into valuable floor space and easily accommodate columns and obstructions with minimal loss of space. We can locate openings and stairways wherever they are needed and increase the capacity of heavy load areas. 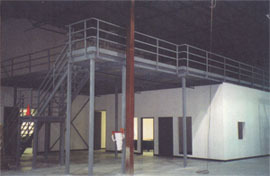 Free of support from your building giving you a complete open area for storage both on the ground and Mezzanine levels.